How Can Stress Affect Your Eyesight? Most of us are aware of how stress affects our body, but did you know that it can also have a negative impact in your eye health? Trying to not let stress affect us might be an unrealistic expectation, which is why our optometrists at Valley Eyecare Center want you to learn about its impact to our eye health. Eye strain, also known as Asthenopia, is a very common condition that occurs when eyes are overused. Most of us are guilty of spending a lot of time looking at electronics and computer screens daily—and it can really take a toll on our eyes. While research hasn’t proved that screens can cause true damage to the eyes, you’re still at risk for headaches and eye soreness. Stress can trigger a migraine or tension headache—especially if you have lost your appetite. 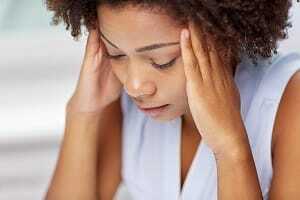 Migraines are hightened headaches that are accompanied by a multitude of other symptoms such as flashing lights or colors in your vision field, pain so severe that you can barely think, nausea and vomiting, and increased sensitivity to light. Tension headaches affect your forehead, are less severe and lack most of the other symptoms. An eye twitch is when the tissues and small muscles around the eye experience involuntary movement. The twitch may last minutes, hours, or even days and even though it typically isn’t dangerous, this condition can certainly interrupt your concentration and focus. When blood pressure goes up, your internal eye pressure may do the same. Glaucoma is a condition that results from high eye pressure damaging the optic nerve, and has the potential to cause permanent vision loss and blindness. It is important that people learn how to manage their stress to avoid compromising their sight. For more information about eye health or to schedule an eye exam with one of our optometrists, visit our website.